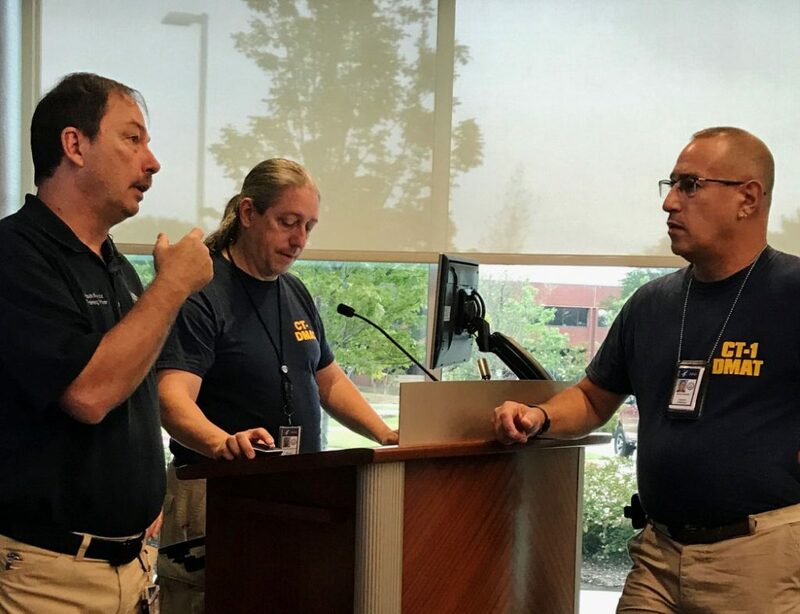 ECSU emergency management professor Kevin Kupietz, left, talks to emergency management team members during the aftermath of Hurricane Harvey in Houston, Texas last year. Kupietz is a member of a national disaster relief team. As a member of the ECSU Emergency Management Faculty we would be remiss if we did not send out a word of caution for the upcoming storm. It is always important that individuals, families, organizations and communities are prepared for emergencies/disasters. North Carolina is currently looking at greeting Hurricane Florence at the end of this week. 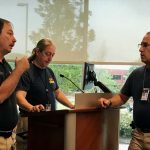 The Governor has issued a state of Emergency for North Carolina this past Saturday and the State Emergency Operations Center opened on Monday to start coordinating the assets and supplies needed to respond and recover from such a storm. Projections are still not certain as to the direct impact or even the force but communities are being warned to expect hurricane force winds, large amounts of rainfall resulting in strong potential for flooding and power outages. September kicks off the FEMA disaster preparedness month celebrations, so the question to you then is, Are you prepared? FEMA’s website at Ready.gov gives several recommendations for preparedness such as the amount of bottled water you should store at home. The recommendation is 1 gallon of water per person per day. Ideally a home should be prepared to be self-sustainable for at least 72 hours. Is there food such as canned products that will sustain the family? If it is canned food is there a manual can opener available? Seems like a no brainer but this is a common problem as society has become reliant on electricity and the convenience it brings. Is the automobile fueled up prior to the storm. A family should have access to cash in case ATMs do not have power and the banks are not able to open. Generators are nice to have to provide some electricity including keeping the food in the fridge and freezer from expiring. If power is not maintained to the refrigerator and freezer watch the food to ensure that only safe food is consumed. Cold food will remain colder longer by maintaining the door of the appliance closed as much as possible. If the quality of the food is suspect, do not risk the illness. Kevin Kupietz is a member of the ECSU Emergency Management program faculty and a national disaster relief official.